Question about the agar filtration, do you still let the ice block melt under refridgeration or can it defrost at room temp? Is that where the reduction in time comes from? Bobby, agar allows defrost at room temp, once iced simply put in a strainer outside refrigerator and wait few hours. Note that is valid only for foods that not contain fats. The cold in the fridge maintain solid fats while defrost, at room temp these fats melt. 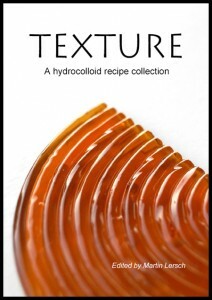 Hydrocolloid recipe collection v.2.1 <- i like it..thx for article ..This article very helpfulll..i put this article to my bookmarks. I can’t thank you enough for compiling this book. For those of us just starting to try and get a handle on all of the possibilities, your gathering of data and recipes is unbelievably helpful.